As the name indicates, the Order was founded for reward of military merit, by the Grand Duke Charles Frederick, on the 4th April, 1807. 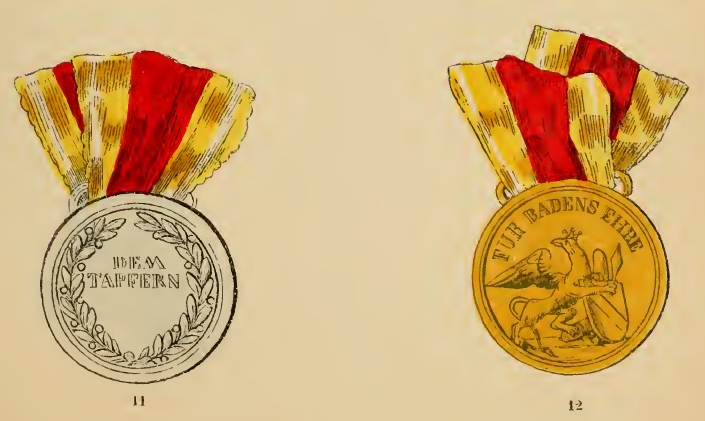 It is designated as a reward — as the patent says — for the exploits of officers who might have neglected them with impunity, or were performed by them with peculiar skill, wisdom, courage, and decision. It consists of three classes : Knights of the Grand Cross (to which only Generals are admitted), Commanders, and Knights. The number of the members is unlimited. The Grand Duke is Grand Master of the Order, and has the right to confer it on whomsoever he pleases without consulting the Chapter. The latter meets every year on the 20th November, when the claims of the respective candidates are examined, and taken into consideration. The chairman, on that occasion, is generally the Grand Duke, or in his absence the senior Knight of the Grand Cross. The three oldest members of the three classes enjoy a pension of 400, 200, and 100 fl. (£40, 20, and 10) respectively. The badge of the Order is the Cross (No. 4) suspended by a ribbon of three stripes, yellow in the middle and red at the extremes, and with white borders. Both the size of the Cross, and the width of the ribbon differ in each of the three classes. 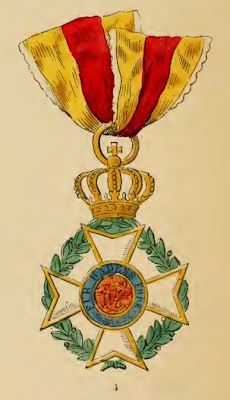 It is worn by the Knights of the Grand Cross across the left shoulder towards the right hip ; by the Commanders round the neck, and by the Knights at the button hole of the left side. The Cross is accompanied by a silver star (No. 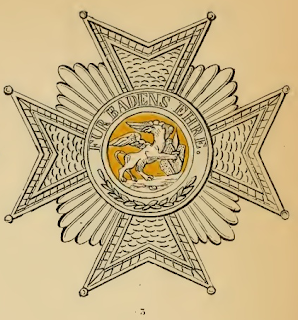 3) attached to the left side of the breast, and the centre of which resembles the reverse of the Cross ; it is presented to the Knights of the Grand Cross at their nomination, while the Commanders only receive it when they occupy the rank of Generals, or are about to be promoted to that rank. The Order was last conferred in 1820. 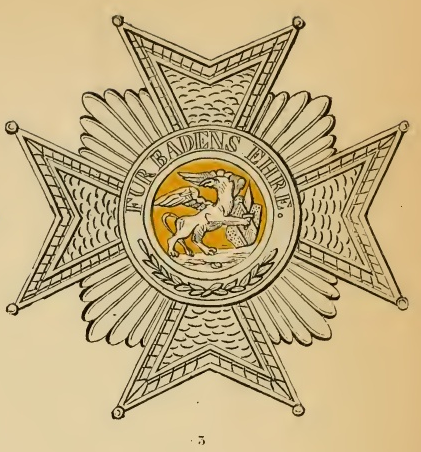 Equally with the above Order, was founded for sub-officers and privates, and under similar qualifications, the Military Medal of Merit, which is worn (Nos. 11 and 12) at the button hole of the left breast. It is presented either in gold or in silver. To the former is attached an increase of double pay, and to the latter of half pay.